Microsoft has officially launched the Dynamics 365 Business Central. This is basically the next version of Dynamics NAV but can be deployed on as a subscription as part of your Office/Dynamics 365 portal. Microsoft has tentatively stated that the on-premise will be released the summer of 2018. When that rolls around, you’ll have multiple options on where to deploy your solution. On this subject on deployment, it will be in another blog article. I personally believe the implementation of the Dynamics 365 Business Central infrastructure is pure genius from Microsoft. The infrastructure, on it’s own, is perfect. You can access your ERP data from anywhere in the world without having to worry about hardware and security setup. You don’t have to setup Azure and it’s practically plug-and-play. Furthermore, you get free upgrades and cumulative updates applied as they’re released by the Microsoft product team. You basically require zero IT infrastructure spending to run your business. What set this infrastructure apart is the ability for developers to create customizations that can be implemented through extensions. The extensions are like of like widgets or little apps that you can install for your instance of Dynamics 365. It’s like having an Apple phone with apps that you can download from the app store to enhance your experience with the phone. The ease of deployment and the free updates from their subscription, in addition for you to download and install extensions from the Appsource store is the next best thing since sliced bread in the ERP world. While the infrastructure is perfect, there are some questions on who Microsoft believes are the profiles of the users that will be using the product. Is Dynamics 365 Business Central catered towards micro-businesses (1-5 user companies) or is it catered more for small-mid sized companies (10-500+ users) as it traditionally is? I’ve wondered about this since they introduced the concept to what was known as Dynamics 365 Finance and Operations Business Edition (RIP). There are some features that makes no sense for micro companies and there are some features that absolutely wrecks havoc on small-mid sized companies. One of the promise from Microsoft is that they will make the software extremely easy to use. To some extent, they’ve really done quite a bit on the user interface. They’ve added very nice charts and statistics, in addition, the screens are extremely beautiful. But let’s make a distinction on ease of use and dumbing down the software. Let’s take a look at the Item Card as an example to see what I’m talking about. Note that this is only available if you set the User Experience on the Company Information to Basic or Essential. If you look at the inventory item card, you’ll notice an icon next to the quantity on hand field. If you click on it, a screen will pop up to allow users to just change any quantity for each location. This means that anyone with access to the items can change the quantity without proper procedures and counts. Imagine running a mid-sized companies and allowing your users to be able to edit inventory quantities to any amount they wish. I think this feature is probably more suited for the suited for mom and pop shop. Where you can just look at your shelf and adjust quantity on the fly. However, on the same item card, you’ll notice something on the ribbons that’s promoted (meaning a large icon). It’s the approvals/workflow management icons. And that’s my approval/workflow request. Do I really need to automate or systemize this? It’s a colossal waste of time to even opening an e-mail about it. I think bugging her with an e-mail will annoy my boss more and maybe that’s the point? But I digress. The point is that in this one simple screen, you seem to have 2 features that cater to a very different clientele that will balk at each other. I think in this case, you really can’t please either sides. Given the choice, I’d rather Microsoft focus the application to small-mid companies, like what the marketing message states. We’ve implemented micro-businesses using the old Dynamics NAV product with great success. I don’t see why it has to be different with Dynamics 365 Business Central. I don’t like how “adjust inventory” doesn’t allow for “Entry Type=Transfer” when actually trying to transfer inventory. Let’s say I wanted to move those desks to BLUE. 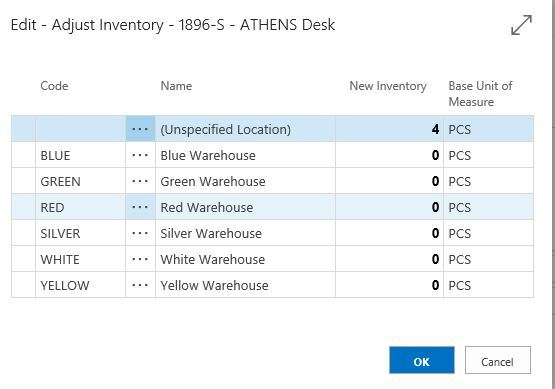 If I made blank location 0 and BLUE location 4, D365BC would show a negative adjustment and a positive adjustment as the entry type in item ledger entries. It is possible that a mom & pop operation would never have to dig through the ILEs to figure out what true negative and positive adjustments occurred vs. transfers based on Entry Type. And, if everything is done correctly, the result is the same. But, it would be nice to see this. Maybe this will be a feature in the future. I’d rather they take it out altogether. Let the normal workflow procedure handle inventory quantity transfer/adjustments. It’s easier to explain to the auditors that way. I agree. It was bad enough when the “…” was added next to Quantity on Hand in the Item Card to allow inventory to be changed on the fly for blank location code (in 2017? ), but it is even worse now that the same window allows for different locations and thus not-a-transfer inventory transfers. At least with the blank location inventory adjustment, one could be sure that the user didn’t intend to transfer.